Ethnic minorities are being encouraged to vote by a new poster spoofing the Bullingdon Club, the elite Oxford dining society that counted David Cameron, George Osborne, and Boris Johnson as members. 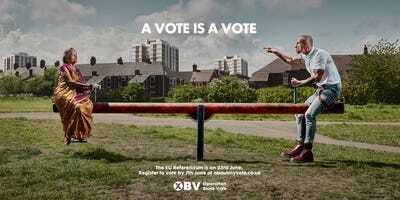 Operation Black Vote have produced the poster spoofing the Bullingdon Club with ad agency Saatchi & Saatchi. You can see the original photo it is spoofing, which features Boris Johnson and David Cameron, here. There are 4 million black, Asian and minority ethnic people in the UK but Operation Black Vote says just half of them are likely to vote in the June 23 referendum on EU membership. Current polls show Britain is heading towards a Brexit, with the latest numbers on Tuesday’s polls putting the Leave campaign between 3 and 7 points ahead of the Remain campaign.